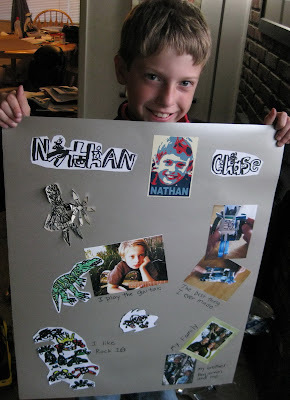 Here is Nathan's Star of The Week poster, which will be displayed in his class all week. The design was completely his, from the selection of photos to the placement of art. It shows remarkable restraint, as normally he's quite over the top in his decorations (he subscribes to the school of "More is More" rather than "Less is More"). Each day he'll get to do a different activity, like reading his favorite book to the class or bringing a special toy to share. He's a celebrity among second graders!